Problem: In the original Star Trek series, the both measures "sector" and "quadrant" are used contradictory. Both mean a spatial volume that is considerably smaller than the Galaxy, but also fundamentally larger than a single planetary system. Although "quadrant" literally refers to a "quarter" and therefore should be logically used for naming a quarter of the Milky Way, it usually refers to a smaller, sector-sized area of space, e.g. "quadrant 904" in [TOS] The Squire of Gothos. Since Star Trek VI, that means the late 23rd century, commonly a new, more correct quadrant system is used, according to which "the Galaxy is subdivided into 4 quadrants, from which each forms a 90 degrees piece of cake, viewing the Galaxy from the top or the bottom" (Star Trek Encyclopedia). However, the assumption that solely this system is used seems to be wrong, since some Next Generation episode use the term "quadrant" like TOS as a sector-sized region (e.g. the "Morgana quadrant" in [TNG] The Child and Where Silence Has Lease). Reasons: It is simple to explain why the "quadrant" was originally used contradictory - at that time, the measures sector as well as the quadrant weren't fixed at all und were used at will by the authors. They were determined a long time after TOS, in case of the sector not before 1994, when the Star Trek Encyclopedia was published. While there hasn't been an on screen definition of the sector up to now, the quadrant was defined for the first time already in 1979 for the unofficial "Star Trek Maps". To scale the poster-sized maps of this project, the Galaxy was divided into nine quadrants: quadrant 0 at the galactic core and four quadrants North and South*. This subdivision of three-dimensional space called "octant system" in mathematics more logical in that respect that the Milky Way isn't a flat two-dimensional disc, but has a thickness of 5000 ly on average, with Earth being located 50 ly above the thought central dividing plane, the so-called "Galactic plane". However, the system, as the maps themselves, was never acknowledged by official sources nor regarded as "canon". Believing the background sources, on the other hand, the quadrant system used in the new series and the feature films and the distinction between the densely populated Alpha Quadrant and the mainly unexplored Beta Quadrant was originally introduced to justify Kirks remark in Star Trek II (premiere date: 1984) that the Enterprise is the sole starship in the quadrant - even though this doesn't make this quote more credible (since with Vulcan, Antares and Rigel, three important main planets of the Federation are located in the Beta Quadrant). In Star Trek VI, this system was extensively used for the first time, and the position of the large powers in the single quadrants was determined (Klingons and Romulans in Beta Quadrant, Federation in Alpha Quadrant). Already before the premiere in 1991, the new quadrant system was introduced for Star Trek: The Next Generation with the episode [TNG] Der Barzanhandel, that aired in 1989. Therefore it is logical that some TNG episode of the first and second seasons use the "quadrant" differently, even though they play a long time after Star Trek VI. Potential explanation: In the early and middle 23rd century, the term "quadrant" was used parallel to the "sector", i.e. it referred to a smaller area of space with a certain diameter. In the 2280s, a quadrant system was introduced that is valid up to now. This system divides the Galaxy into four equally sized, cubic quadrants. While most of the old quadrants were newly numbered as sectors, some quadrant designations were kept as proper names for historical reasons, even though they actually contradict with the common quadrant system. Therefore, there are even in the 24th century quadrants that do not carry the designations Alpha, Beta, Gamma or Delta. Additional note: Read more about quadrants and sectors in chapter 2.2 of the Star Trek Cartography "The subdivision of the Star Trek Galaxy". According to this, the quadrants are arranged fairly illogically, neither clockwise nor counter-clockwise: the lower left quadrant is called "Alpha", the lower right one "Beta", the upper left one "Gamma" and the upper right one "Delta". However, the final arrangement of the quadrants was unimportant, since (labelled) charts of the Galaxy were never used in Star Trek: The Next Generation or in Star Trek: Deep Space Nine. Apart from the fact that according to the development in Star Trek VI Alpha Quadrant and Beta Quadrant must be adjoining regions of space (what is natural in view of the designations), the spatial situation did never play a role for the plot anyway. Therefore, the system was accepted by the fans without difficulty and declared "canon" - until Star Trek: Voyager aired. The new series dealt with the journey of the USS Voyager, which has been stranded deep in the Delta Quadrant, back home to the Alpha Quadrant - what seems logically if Earth is located exactly on the borderline between two quadrants. 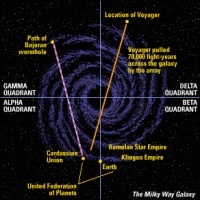 Consequently, according to the official arrangement of the quadrants, Voyager would not only have to cross the Delta Quadrant, but also the entire Beta Quadrant, before she reaches Earth. Surprisingly, this fact was never mentioned on screen. Instead, the Beta Quadrant was hushed up and virtually banished from the "Voyager" Galaxy. Although it plays an elementary role with regards to the sphere of influence of the Borg and the Romulan and Klingon empires, and therefore should be mentioned in the series, there are not more than two reference in 145 episodes: in [VOY] Before and After ("like the Yattho from the Beta Quadrant, who can predict the future [...]") and in [VOY] Timeless ("Starfleet found a Borg cube wreckage in the Beta Quadrant"), with the first quote being rather trivial. 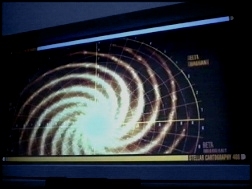 Moreover, there are increasingly references regarding the Alpha Quadrant which should actually concern the Beta Quadant, like in [VOY] Barge of the Dead ("The simplest explanation is that the Borg assimilated a Bird of Prey somewhere in the Alpha Quadrant" - not likely the simplest explanation). Although in the sixth season, Voyager is only a few thousand light years away from the border of the Delta Quadrant, there wasn't any reference to the new quadrant in the entire season. 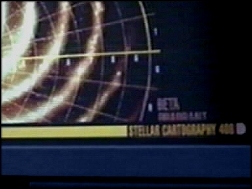 These clues corroborate the impression that Voyager does not need to cross the Beta Quadrant at all to reach Earth, and consequently the Alpha and Beta quadrants must be swapped. 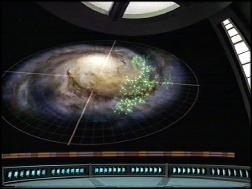 This assumption is apparently confirmed by [VOY] Message in a Bottle, because it was shown in this episode, what was only implied before: according to several references in the dialogue, the USS Prometheus was located in the Alpha Quadrant, but the map shown in the Astrometric Lab definitely marked its position in the lower right quadrant. 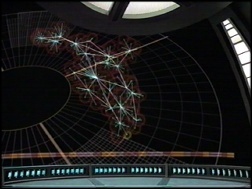 The farthest station of the alien relay network is situated there as well, that spreads up to the "deep Alpha Quadrant" according to the episode. Therefore, many fans accept a counter-clockwise quadrant system with this "on screen evidence", justifying this decision with the generally accepted rule that facts introduced in official documentations are only "canon" as long as they don't contradict with the episodes and feature films. And indeed, the official quadrant system introduced in 1994 was never shown on screen - neither in Star Trek: The Next Generation nor in Star Trek: Deep Space Nine. Beta Quadrant as far as possible simply because they think this would confuse casual viewers, who only know that the crew of Voyager has stranded in the Delta Quadrant and now wants to get back to the Alpha Quadrant, since that is the region where Earth is located. The surely know that Voyager is very near to border, however, according to the series' premise they like to remain Voyager in the Delta Quadrant until it finally finds a way back to Earth, what certainly does not happen before the second half of the seventh season. Consequently, detours and astronomical obstacles are cited as reasons why Voyager still hasn't reached the Beta Quadrant. Of course, this lack of references concerning the Beta Quadrant has finally created the situation that at least those fans who are familiar with the Encyclopedia are fairly confused regarding the quadrant system. Explanation: In the end, the answer of the question what quadrant system is correct after all is quite simple: in the 6th season, the official quadrant system from the Star Trek Encyclopedia was shown on screen for the first time and therefore established as fully canon. Probably, we owe the appearance of the (correctly) labeled Milky Way map in the Starfleet Communications Center in San Francisco the people working at the Star Trek Art Department, not the authors of the episode [VOY] The Pathfinder Project - perhaps even as a reaction of the postings of many confused fans in various newsgroups and forums. Anyway, this map is much more definite than the (non-labeled) charts and indirect statements in [VOY] Message in the Bottle, so that we can forgot these embarrassing errors. Additional note: Read more about the quadrants in chapter 2.2 of the Star Trek Cartography "The subdivision of the Star Trek Galaxy". Problem: During the 35 years covering history of Star Trek, the starships of Starfleet - the Enterprise, the Voyager, the Defiant and many more - have visited hundreds of planets. Thirty-seven of those planets orbit real stars of our Milky Way, e.g. Rigel IX, Antares IV and Tau Ceti Prime, so that we can exactly determine their situation relative to Earth in the meantime. Most positions, however, remained unknown, what isn't necessarily a bad thing regarding worlds which only played a role once in one episode. But - a frequently raised but rarely answered question of the fans is the query what star the probably most famous fictitious Star Trek planet orbits; those extra-solar world with which Earth made first contact on April 5th, 2063: Vulcan. 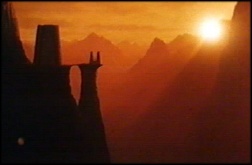 Reasons: Although the home planet of the Vulcans, like its inhabitants, is one of the most important and popular elements of the Star Trek universe and the setting of numerous episodes, the name of its system and therefore its position remained a mystery during the original Star Trek series. Sadly, the feature films and the later Star Trek series continued this tradition, and the Star Trek Encyclopedia as well as all other official documentations ignored the issue. Explanation: Due to the lack of an on screen quote or at least an official statement concerning the real star that Vulcan orbits is canonically unknown, and we can only make assumptions, analysing the properties of known real stars. The star is located in the immediate neighborhood of the Sun. The dominance of Starfleet Command in [TOS] Amok Time (e.g. no time delay of the communication) already implies an Earth-near position. But Star Trek: First Contact and the official Star Trek history make a farther distance from our star unlikely as well - otherwise, Vulcans wouldn't have been the first aliens that had contact with the human kind. 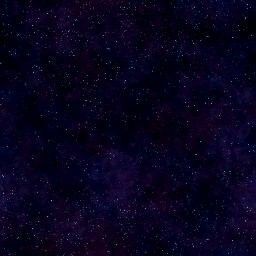 The star is located near the real star Altair, consequently being only one or two dozen light years away from Earth. The distance of Vulcan from Earth can be determined even more precisely with the help of [TOS] Amok Time. The Enterprise travels, from an unknown starting point, to Altair IV, making a (inconsiderable) detour to Vulcan. Because the mission is very time-critical and only covers a few days, the distance between Altair and Vulcan must be relatively small. The Vulcan sun is an orange-yellow star. 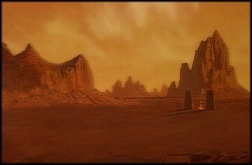 When we saw Vulcan for the first time in [TOS] Amok Time, it was a reddish, hot world. 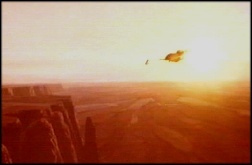 Although this basic characteristic was always retained, the properties of the Vulcan sun can only be estimated since the more differentiated presentation of the planetary surface in the Star Trek movies. Based on the orange light that shone on Spock during his Kohlinar in Star Trek: The Motion Picture and the shades of orange of the mountains around Mount Seleya in Star Trek III and IV, we can assume that Vulcan's sun is orange as well. It would then belong to a different spectral class than our yellow sun (type G2) - either a high G class or a low K class, while the luminosity class would be essentially the same (V). 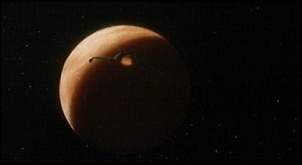 However, this is a quite uncertain clue, since firstly, such details were rarely paid attention to regarding the presentation of planetary surfaces (especially in view of the different appearances of Vulcan in the various movies and series) and secondly, an analysis of the color of a star based on the mere lighting conditions on a planet can be very deceptive; only remember the orange-reddish color of the Martian sky caused by iron-oxide dust. We prefer the identification of 40 Eridani as Vulcan's sun because of what we have learned about both stars at Mount Wilson. The HK Project takes its name from the violet H and K lines of calcium, both sensitive tracers of stellar magnetism. It turns out that the average level of magnetic activity inferred from the H and K absorptions relates to a star's age; young stars tend to be more active than old ones (Sky & Telescope: December 1990, page 589). The HK observations suggest that 40 Eridani is 4 billion years old, about the same age as the Sun. In contrast, Epsilon Eridani is barely 1 billion years old. Based on the history of life on Earth, life on any planet around Epsilon Eridani would not have had time to evolve beyond the level of bacteria. On the other hand, an intelligent civilization could have evolved over the aeons on a planet circling 40 Eridani. So the latter is the more likely Vulcan sun. Two companion stars--a 9th-magnitude white dwarf and an 11th-magnitude red dwarf--orbit each other about 400 astronomical units from the primary. They would gleam brilliantly in the Vulcan sky with apparent magnitudes -8 and -6, respectively. Consequently, 40 Eridani is our candidate. However, it has to be considered to what extent this fact can be called "canon" or "official", even if it has already been cited in countless fandom projects (while it remains unknown who was the first to have this idea). But it is a fact that in the same year, albeit some months before the publication of the article (on March 18th, 1991), the episode [TNG] Night Terrors aired, containing an in-joke regarding 40 Eridani-A, the main component of the trinary system 40 Eridani and therefore making at least the star itself a part of the official Star Trek universe, even if there isn't a reference to Vulcan: the dedication plaque of the USS Brattain identified the ship as "Miranda class, constructed at 40 Eridani-A Starfleet yards". This plaque can be seen in all editions of the Star Trek Encyclopedia, while again there isn't a note regarding the significance of 40 Eridani below this and the "Vulcan" entry. However, the article in Sky & Telescope is sufficiently crucial. In the end, a letter that carries Gene Roddenberry's signature can't be less canon then the "official" documentations of other highly ranked Star Trek employees like Michael Okuda or Rick Sternbach. Just as we treat the Star Trek Encylopedia and the technical manuals, we should proceed here: as long as we hear or see nothing contradictious in the series or feature films, 40 Eridani officially and canonically is Vulcan's sun. Additional note: The positions and basic properties of 40 Eridani - as well as the other real stars of Star Trek - are listed in the Star Trek Cartography table "The positions of the real stars". Thanks to Geoffrey Mandel, co-author of the Star Trek Maps, for the description of the quadrant system. Thanks to Geoffrey Mandel and Rick Sternbach himself for shedding some light on the Beta Quadrant issue. Thanks to Brent Davies, who was the first to track down the letter concerning Vulcan's sun and who has further examined the properties of this star, and Winchell Chung, who has published the complete article - together with many other exciting topics - on his website. More credits for the makers of the interactive Star Trek: The Next Generation CD-ROM, which contains background information on [TNG] Night Terrors, as well as Bernd Schneider, who pointed the temporal correspondence of Gene Roddenberry's letter and the episode.